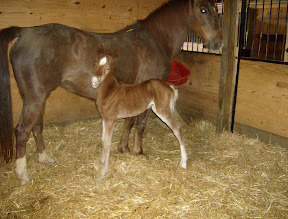 Here is picture of my new filly (Minion Millennium x Lookaway’s Fantasy). I will fill you all in later about the eventful night. If anyboy else has some new family members, let’s see them! 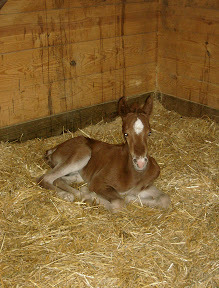 I still would love to have a cutest foal contest. Aw! Congratulations! I didn’t realize your mare was “The Fanny Mae!” I have heard some many wonderful stories about her over the years from Mark, Jen, and people who have worked with her. She is very well loved. She taught me a lot in the two years I drove her and she is a great mom. Out of all my horses, she is probably the only one I won’t ever be able to sell. She has quite a special place in my heart. Thank you all for the well wishes! So far she is quite a little cutie, although she does have a temper…must be the fiery redhead in her!!! I think she is going to be just like her full sister, WMH Fire Dancer; they look like twins at this age.